Blast through the Clearwater’s Granite and Lower Canyons. 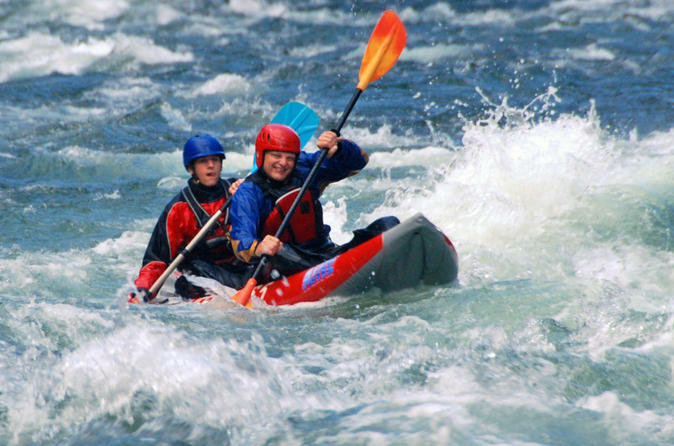 With 4 hours and 14 km of non-stop river rafting and excitement, double the river distance of any other other tour operator in Clearwater, this adventure will be the highlight of your vacation. Splash and charge through rapids like “Shark’s Tooth,” Shane’s Demise,” “The Wall,” “The Basher,” “Buckaroo,” “Tsunami” and “Pink Mountain.” Discover the brilliance of Wells Gray Park’s lush volcanic canyons from your front row seat on the Clearwater River! 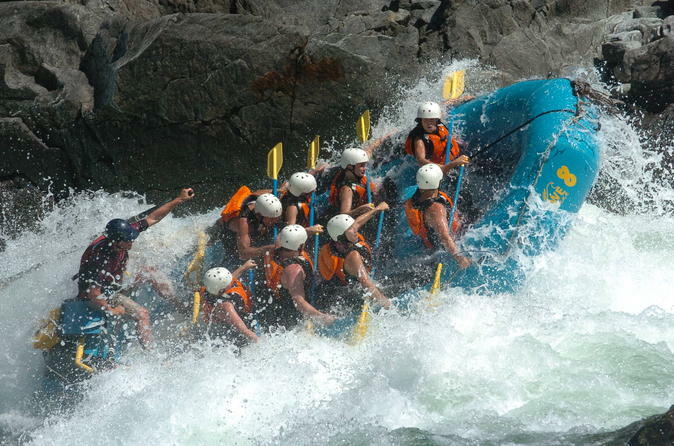 This "get in and rip" trip offers 4 hours of heart pumping exhilarating whitewater rafting, tearing through British Columbia's Wells Gray Park on the world famous Clearwater River. Ready-Set-Go dishes out 14 km (8.7 miles) of pristine River that definately delivers the wow factor. This is the perfect trip if you're looking to fit more than one activity into your day while in Wells Gray Park. Experience the full Clearwater River as never seen before, all while you pilot your very own tandem raft. Enjoy the tour by yourself or with a friend, with a guide ratio of 4 guests per guide. This trip is excellent for families and small groups. Experience hiking to and jumping through a waterfall. Enjoy a riverside scenic gourmet lunch. Join 8-hours of jam packed excitement that will leave you with memories for a lifetime! 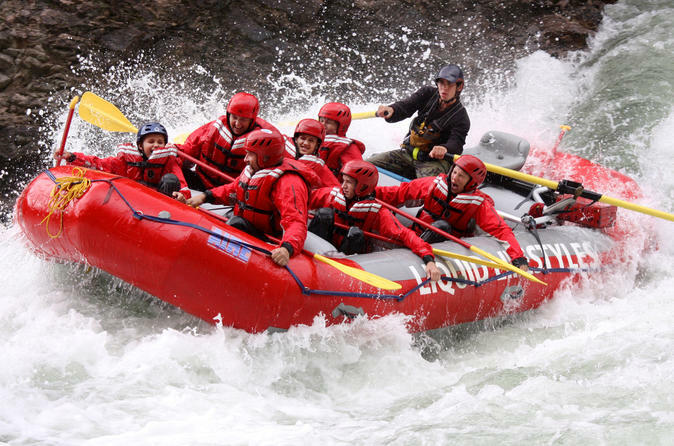 This tour is the ultimate full day rafting adventure in BC, exhilarting whitewater, breath-taking scenery, and an out-going guide versed in all aspects of river safety await your arrival in Clearwater for the Guaranteed Addiction, the always popular, awesome all-day raft extravaganza. So addicting were not sure this trip should be legal. Charge through the Sabertooth, Granite and Lower Canyon's. Experience hiking to and jumping through a waterfall, while enjoying a floating scenic gourmet lunch. 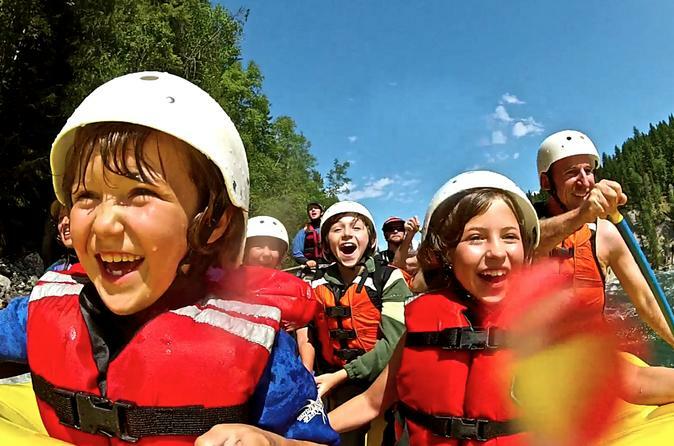 With 8 hours and 28 km of non-stop fun and rafting excitement, this full-day rafting trip is the perfect mixture of intense whitewater rafting and relaxation. Discover the brilliance of Wells Gray Park’s lush volcanic canyons from your front row seat on the Clearwater River! Experience the Clearwater River as never seen before, all while you pilot your very own tandem inflatable kayak. Enjoy the tour by yourself or with a friend with a guide to guest ratio of 4 guest per guide. This exciting experience is excellent for families and small groups. Get ready to charge through 7 kilometers of class 1-3 whitewater. 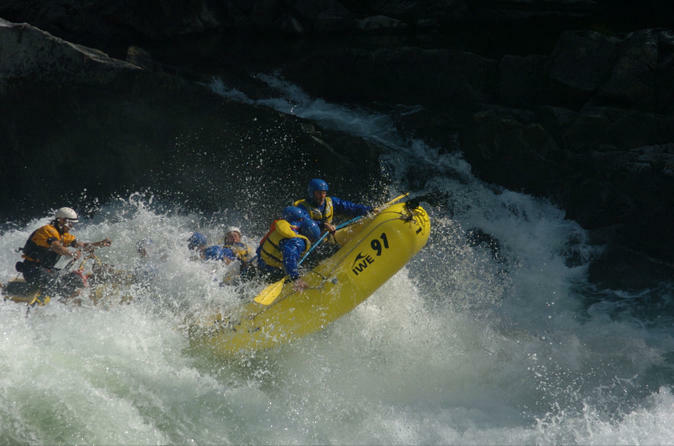 Experience 2 full days of heart pounding thrills on one of the most exciting, rip roaring rivers in British Columbia. 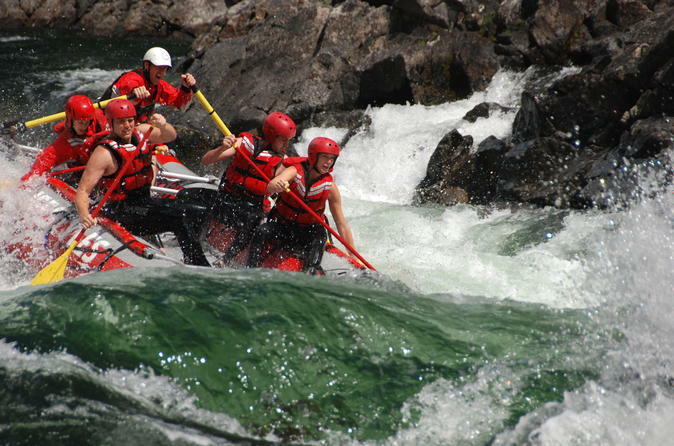 “Ticket To Ride” offers you a rare combination of hiking and rafting in Wells Gray Park. 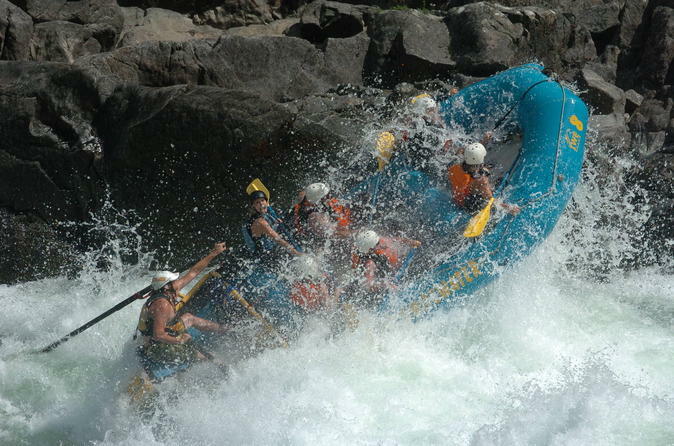 It is two action-packed days on one of the last big volume, free flowing, rivers of its kind in the Pacific Northwest. 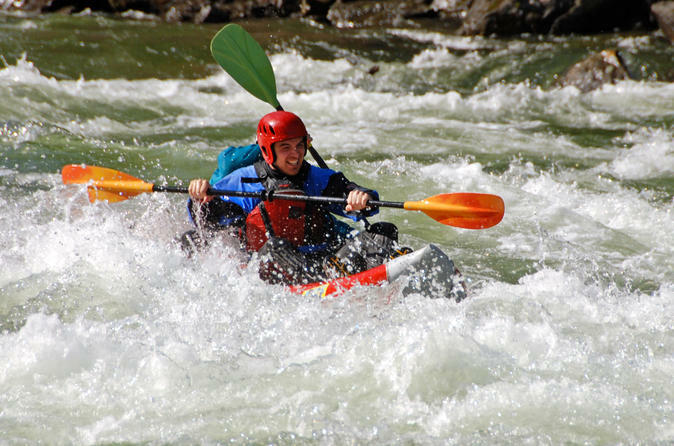 The combination of world class whitewater and exhilarating hikes make this an adventure seekers dream come true. Gourmet Food, riverside chats, and the most well-rounded overnight excursion in the province. The river alone is something to behold, described as one of the most dynamic tributaries of the entire Fraser River System. A family raft trip in Wells Gray Park. Designed for kids as young as 7 years old. This is the perfect combination of fun and adventure. Ride somes waves on this 7 km (4.3 mi) run of the Clearwater River, explore an island, and enjoy a riverside snack that is all included in the "Natural Outdoor Playground." Come and enjoy a family out outing like no other full of epic experiences!